Is it possible to create and load your own proces model into PROM? Or could anyone tell me why they are so different? Does the "Mine Petri net with Inductive miner" base the order of the processes on the timestamps? Maybe the timestamps in my eventlogs aren't specific enough and that's why the order of execution is so weird? ProM is able to import a Petri net in PNML format, so what you need to do is to create your PN using an editing tool and save it in PNML format. Then it can be imported in ProM for conformance checking. To edit and save a Petri net, you can use WoPed http://woped.dhbw-karlsruhe.de/woped/. Thanks for your fast response, I will try the woped tool. Do you also have an idea why the Petri Net that the "Mine Petri net with Inductive miner" plugin created is so different in the order of executing the steps? Yes, I just talked with the developer of Inductive Miner. The X activity is missing in the discovered model. So its better to know which version of inductive miner are you using and the setting information. By the way, it will help a lot to have a look at the log you are using if possible. I have inductive miner version 6.5.122 and I used all the default settings(see image). I can't give you the log files I used at this moment because I need to ask the company I'm working for if I can share the data. But I'm working on that as we speak. Hi Chong, is it possible to sent you the log files by mail so it can stay confidential? My current employer preverse it that way. Yes, I will keep it confidential. My e-mail is c.liu.3@tue.nl. The model you showed should not pose any problems to Inductive Miner, if the log is "close" to this model. (and so on) The visual miner will then show you how the log deviates from this model. To add: it could very well be that the data in the event log does not 'agree' with the model you present, hence the model won't be re-discovered by any process discovery algorithm. Please verify using conformance checking how the data 'aligns' with your process model. Both Sander and Joos, thank you for your comments. I'm looking into both suggestions. But I think I found a problem in the log data. The timestamps in the data are of this format: "HH24:MI:SS" which means that it looks like that certain events will happen at the same time although that's not the case. This will mess up the order of the events and the process model generated by the plugin/algorithm. So I think the structure of the timestamp should be "HH24:MI:SS.FF" to add Fractional seconds to timestamps to get the correct model. But what do you guys think about this? Could this be my problem? You should indeed try to prevent events occurring on the same timestamp, as the order then is uncertain. Process discovery algorithms assume the order they find in the event log, and don't consider swapping events that share the same timestamp. Update: If I change the order of my time in the CSV file from: "2017-04-06 05:45:11.098000000" to "06-04-2017 05:45:11.098000000" it does display the correct timestamp only the fractional seconds are all set to 0 after conversion. So the end result after conversion is this: "06-04-2017 05:45:11.000". I'm still missing the fractional seconds I desperately need. The dateformat at the time of conversion is: "dd-MM-yyyy HH:mm:ss.SSS" but it doesn't work apparently. My last two posts where more about another question so I created a new question with the same information. 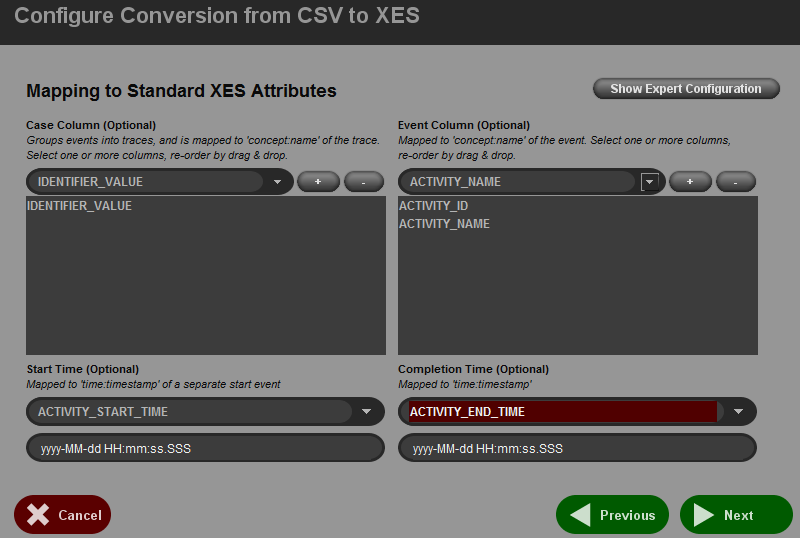 You can find the question in this link: http://www.win.tue.nl/promforum/discussion/811/timestamp-incorrect-after-converting-from-csv-to-xes#latest.